Ok, so I'm doing more performance testing. I'm making the level bigger/longer. I filled in the walls of of my level and I see a performance drop. It's just one texture. So CE is drawing the entire level and making starling draw all objects even outside of the viewport? I remember coding in the commodore 64 days where you only draw a section outside the viewport and then scroll them into view to save resources. Is it better to go this route? CE is not automatically culling objects outside of the camera so they are in the display list and that may affect the performance however the gpu shouldn't be processing anything outside of the viewport. I don't know what the best approach is but I'd consider having something like the QuadTree sprite extension for some or all display objects attached to CE objects, and when 'visibility' switches for these display objects, call relevant function on CitrusObject, a function that would be overriden and in which anyone could enable/disable some update code for objects that are outside of view. The game engines I read up on has tile culling. One approach is to reference the display objects in a 2d array. When the Objects come near the viewport/camera, it's made visible, else invisible. Unity has occlusion / frustum culling built in the camera. On mobile draw calls are expensive! Gsynuh mentioned that the gpu will not draw things outside the viewport but the cpu still spends time issuing the draw call and uldating buffers and the gpu still runs the vertex shader etc but just bugs out before pixels are filled. Culling can be essential! Forget occlusion culling for 2d though and think of the fastest easiest viewport culling. Grids are very easy to code/manage. But different games or usecases can benefit from more specific culling methods. Simplest could be to check each objects transformed bounds again the viewport and just hide any objects that are outside of view. The more you know about an object thouh the faster you can cull it. I.e. if a container had 100 objects in it but you knew they were all bound within some radius due to their control code you could just cull the container without considering its children. Thanks. I'll give the viewport culling a try before moving on to unity. I'm doing a quick cull in the update function in GameState. The performance shot back up to 60fps. I can't get the clipping right though. The top and left objects are getting culled while on stage. I've tried lots of things unsuccessfully. You need to check the while bounds of an object not just its x and y. The x and y could be outside the bounds but a big object could still intersect it. You need a rect vs rect intersection test and it needs to be done in a correct space. 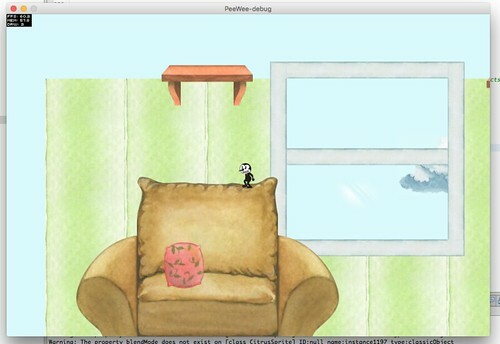 It doesn't work on CitrusObjects with a slow parallax setting. Any ideas? I think I need to keep track of the transformed CitrusObject instead of the static position. Not sure how. So using camera.getRect() is giving you the camera rectangle in the "world" space so that's correct. However because of the parallax system, x+width as you are doing is not giving you the right rectangle in the world space for citrus objects - you need the right bounds of the starling object and I'll tell you how. citrus object are represented by a StarlingArt object which is a CE class that extends starling Sprite. inside a StarlingArt you will see whatever content (quad,image...) that the citrus object should be represented by. So StarlingArt.getBounds() will return the correct bounds for any citrus object. In a Starling project, this ICitrusArt property will actually be a reference to a StarlingArt object. Now you need to compare rectangles in the same space. All StarlingArt objects are inside a container, the same container that the camera system is using to move things around for a virtual camera. And that's the same space camera.getRect()'s rectangle is in. So checking this rectangle against a StarlingArt rectangle will happen in the same space. Hope that wasn't too horrible to read. Let me know if I need to rewrite something differently. I haven't had time to look into viewport culling yet but we know StarlingArt and the camera class would need to work together to make that happen and not do unecessary check and have most options people want. Just an idea here, you could be using object pooling, CE has something built in for that. objects that are returned back to their pool are made invisible and disabled (physics) so they can be reused later, well that's the default behaviour but it can be customized without modifying the core code of the system. the body and or texture of an object can be changed each time it's reused so it's less objects in a scene in total and they constantly shift for potentially infinite worlds , though that means implementing your map as a data structure and based on the camera's position in the world decide on what to do with killing/spawning objects back "in front" of the camera and so on. The above code made the app stop to a grinding halt at 1fps, not sure why so I used view.camera.getRect() instead. The good news is it is better in performance at 50fps but didn't bring it to 60fps. It'll only get worse when I populate it with enemies and such. I guess cycling through all of the CitrusObjects isn't the most optimal thing you can do. I guess I'll give unity a shot and compare the performance. Hmmm something is deffo going wrong here I think. Could you post another scout output in its current state? Also can you share some info about the scene. How many objects. Static or dynamic. Lots of enemies pickups or platforms? My gut feeling is starling/citrus should cope with this. Glad you reminded me to check scout. This got the fps back to 60fps but the parallax Art is culling incorrectly. I think all of the Casting has a negative impact on performance. There are about 610 citrusObjects right now the loop is going through. There will be more and a handful more Nape Enemy Objects with dragonbones views to be added. gsynuh's solution with level in an array or file (Tiled.tmx) with CitrusObjects in a pool being created and destroyed in conjunction with the camera sounds like the best optimal solution though. But it'll take time to develop. I wonder if the time is best spent learning Unity instead. I keep hitting performance with CE. I might hit less performance issues with Unity. stalingArt is a Casted object and had the same result. Casting is bad for performance it looks like. I played a little with CE's core code and came to the conclusion that the framework wasn't built for effective culling. Also it needs some cleaning up. I see a few spots with down casting in update() in some classes. To be effective, the main State or the camera needs access to the CitrusObject for culling. I know CE is being rewritten for starling 2. Hope you keep culling & mobile in mind. It doesn't need some complicated algorithm like quad tree or whatever, that actually is too slow for mobile I hear. A simple viewport test like above is fine. I remade my game sample in Unity and it crushes in performance. I had to lower the fps to 60 to save battery life. It's best if you move on to Unity. Not only performance is better, development time is a lot faster too. It does take time to get used to it though if you're entrenched in AS3 development. You also have the freedom to make 3d objects and games also.